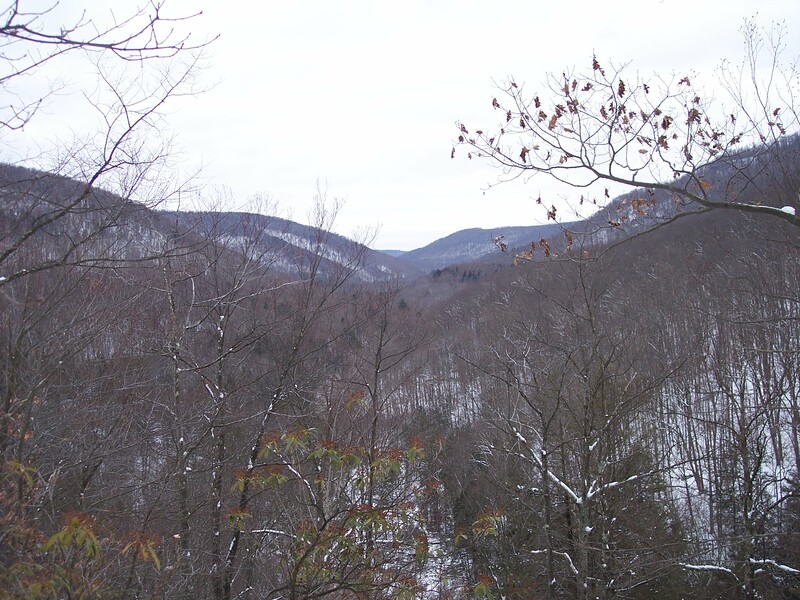 This weekend I returned to SGL 13 to scout the Endless Mountains Trail along Quinn and Shanty Runs. Saturday was bright and sunny, and fairly warm. A great day to be out. We drove through Jamison City and reached the game lands, where the road was rebuilt after the floods; it looked as if the road had become the streambed, with cobbles on both sides of it. We began by hiking up the gated road. Soon, Twin Falls came into view from the road, roaring from down below. The creeks were still high as springs seem to seep from everywhere, creating rivulets and tiny waterfalls down the mountain. 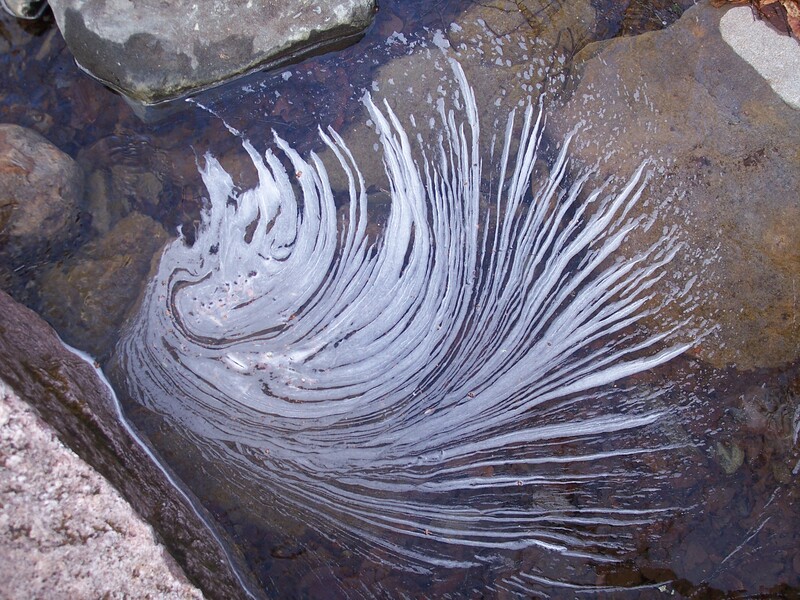 There were even some interesting ice flows, slowly melting in the sunlight. 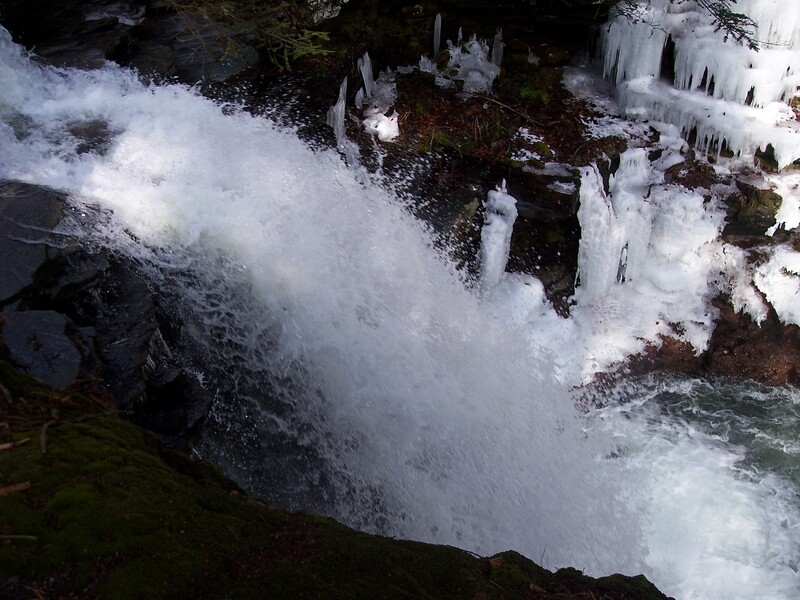 We reached Lewis Falls as it plummeted into an icy grotto. It was an impressive sight. We took a break as I wondered how we were going to cross the creek. Heberly Run was far too swift above the falls. We hiked up along Heberly Run looking for a place to cross. 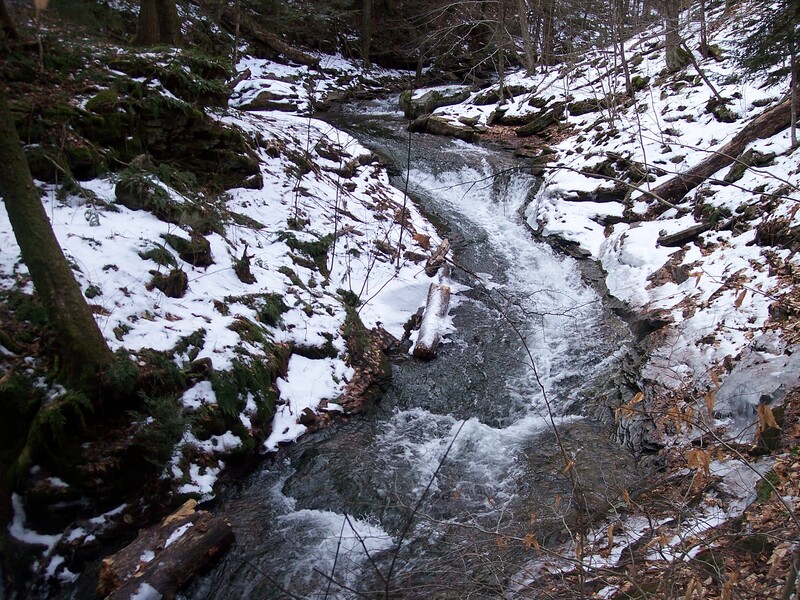 This is a beautiful stream and I hope to explore more of it. We passed a small chasm with rapids and a slide. We were able to cross this swift stream by hopping on rocks. After a hike back down to Quinn, we wouldn’t be as lucky. After trying to find the best way across, we made it, but not without wet feet. We hiked up the trail to the juncture of Quinn and Shanty Runs, a place of remarkable natural beauty. 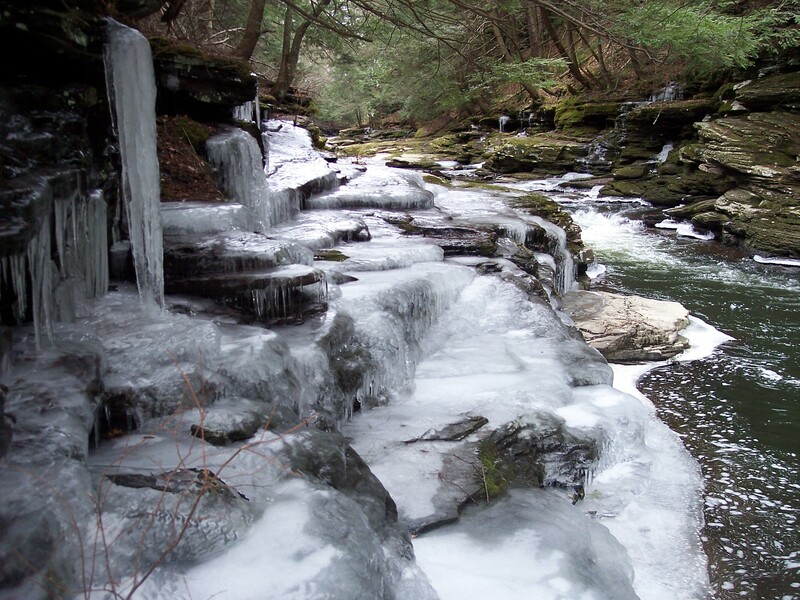 The Endless Mountains Trail is anticipated to follow a grade up along Shanty Run which has a carved a very deep gorge harboring several more waterfalls. 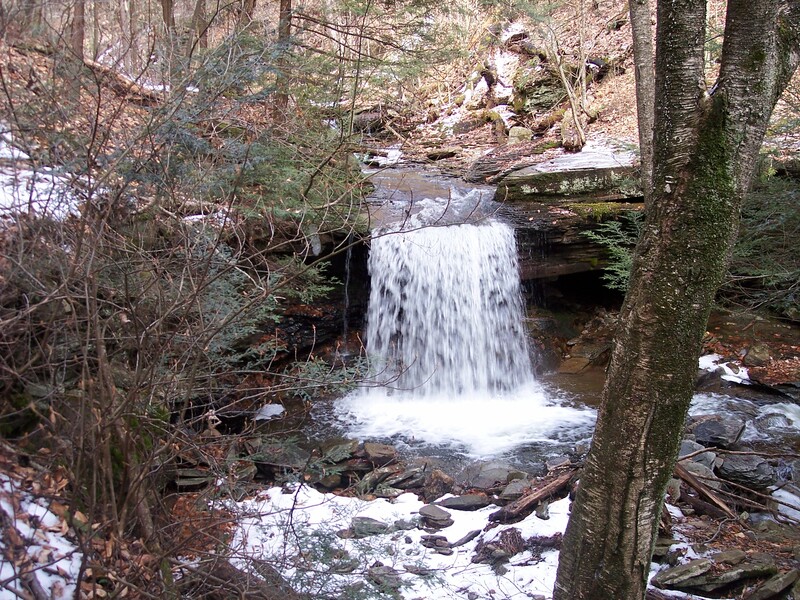 Quinn Run also joins with its own series of waterfalls and waterslides under ancient hemlocks. Some places just feel special, this is such a place. It was getting late and there were still many more miles to go; the terrain along Quinn Run up to the plateau is steep and difficult. We decided to turn around. We had to face the same two difficult creek crossings, and on the first I just accepted my feet were going to get soaked as I just walked across. The water was frigid. I will have to return to finish my scout of Quinn Run to Muncy Creek. We walked back down to the car as the shadows began to stretch across the deep mountain hollows. Flood ravaged Mehoopany Creek. There used to be trees along the creek on the right. The road had been washed away, but is now rebuilt. This past weekend I was able to return to place I used to visit often- SGL 57 and Stony Brook. The September floods on the Mehoopany Creek were unprecedented, causing catasrophic devastation. A bridge was destroyed, and the creek carved a new channel on the other side of a concrete bridge, erasing the road. It was truly a bridge to nowhere. It is hard to imagine the power of water. The creek carved new channels, deposited massive banks of gravel and cobbles, and lined its course with a canyon of trees and root balls that now rise above the water. The village of Forkston is still affected by the floods, and its parks and ballfields look like they had been bulldozed. The roads are now mostly repaired. Snow coated the valley and made the floods look like a distant memory. But you could still see what remained. Twigs, leaves, and branches were wrapped around tree trunks by the torrent, at times over a hundred feet from where the creek now flows. I reached Stony Brook and my plan was to hike up the old gravel road that goes to a cabin. That was impossible. The road had become the stream and was cratered with erosion. I took a grade high on the other side of Stony Brook so I could get a better view. What I saw was astounding- landslides tore into the side of the mountain, triggered by the creek flowing against the base of the slope, and completely wiped away the road to the cabin. I don’t see how the road could ever be rebuilt. Stony Brook itself is a small stream, but it left a stripped flood plain almost 100 feet wide. I didn’t know where to hike, until I spied what appeared to be a clearing on top of the ridge between Stony Brook and Mehoopany Creek. 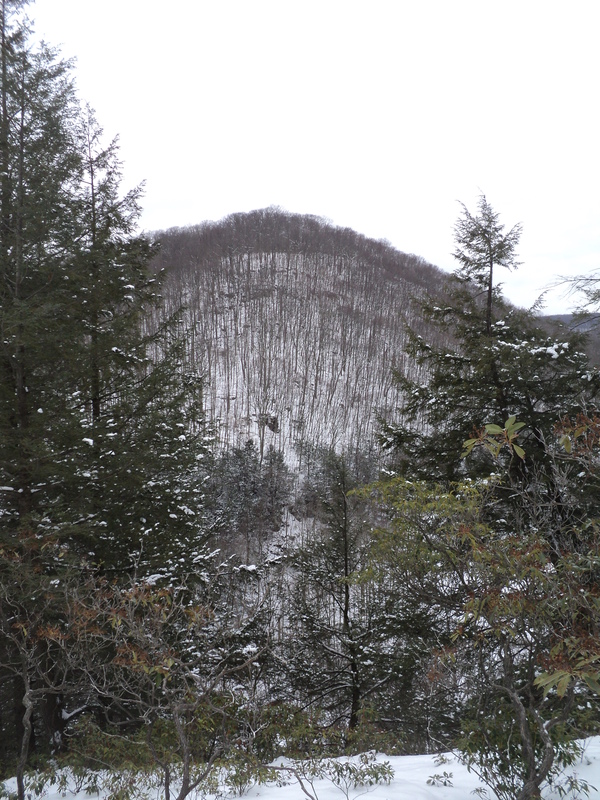 I had thought about hiking this narrow ridge between the creeks before, itself a product of erosion. 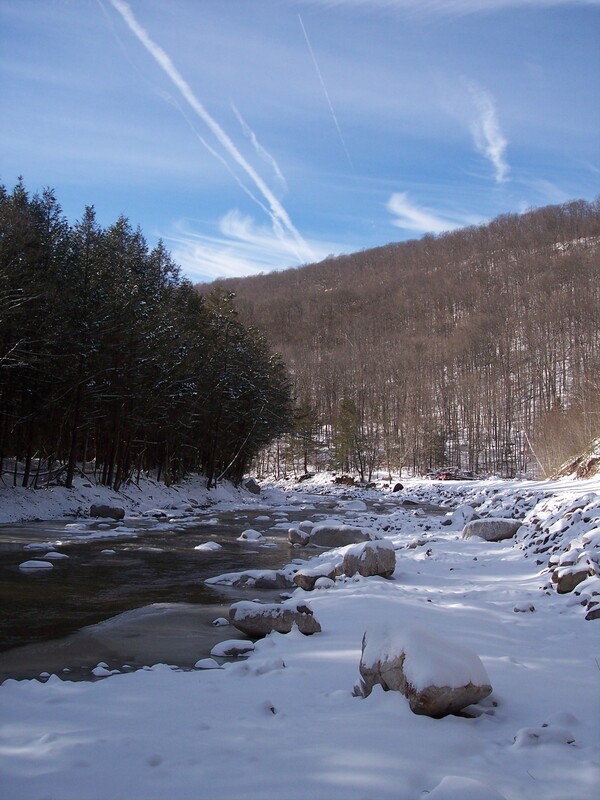 On one side, Stony Brook is eating away at it, and on the other side the Mehoopany is doing the same. I began my trek up to the top, to realize it looked like a spine- very narrow with steep drop offs on both sides. It also looked like there was a trail on this spine. It was much more difficult than I expected, especially with the snow. I didn’t have crampons and I had to scoot down one section on my rear end. 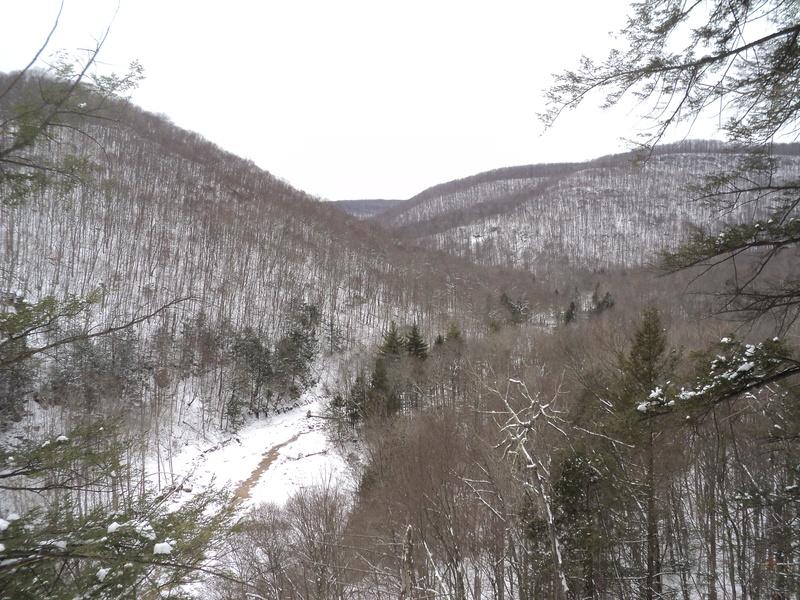 The skies clouded over and I soon reached the top, which offered great views looking up Mehoopany Creek’s isolated valley. I continued up the spine to another fine view through an opening in the hemlocks and mountain laurel. I continued up the ridge and gradually gained elevation. I entered an oak forest with several large trees, covered with phosflourescent lichens. I soon reached the best view, looking up Stony Brook and its incredible flood plain torn through the forest. It has hard to imagine such a small creek carrying that much water. Great view from The Spine looking up Stony Brook. Notice the incredible flood plain from the September, 2011 floods. Although I wanted to explore more, I had to get back. 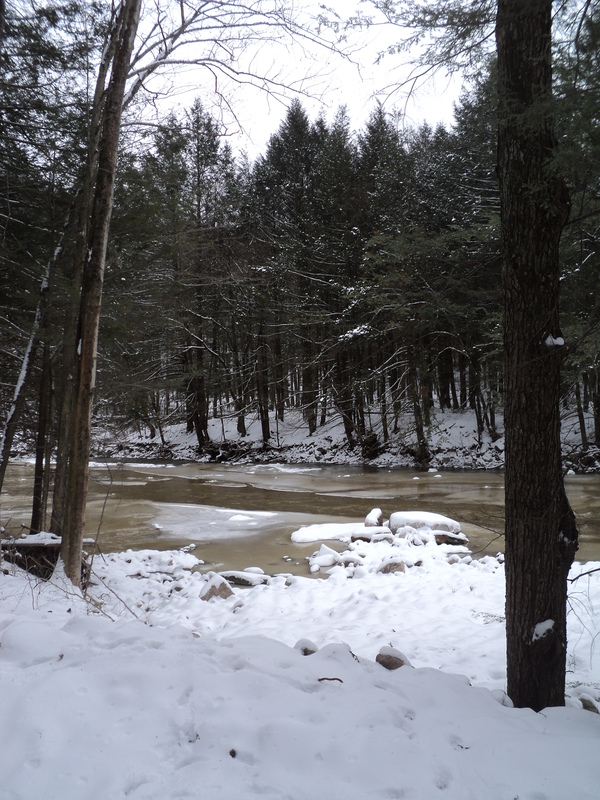 So I retraced my steps and made my way down the snow covered slopes to the Mehoopany Creek as it calmly flowed under snow dusted hemlocks and ice, the water still brown from the floods. Last Friday night, several inches of snow fell, leaving about 6 inches of powder by Saturday morning. Saturday was bright and sunny, so I was looking forward to getting outside to enjoy some of the white stuff. I soon decided to get on my snowshoes and trek some of the trails behind my house. Six inches of powder isn’t much to snowshoe, but with the warm winter we’ve been having I knew I wouldn’t have many more opportunities to use them. I followed the trails, leaving a wake of compressed snow. 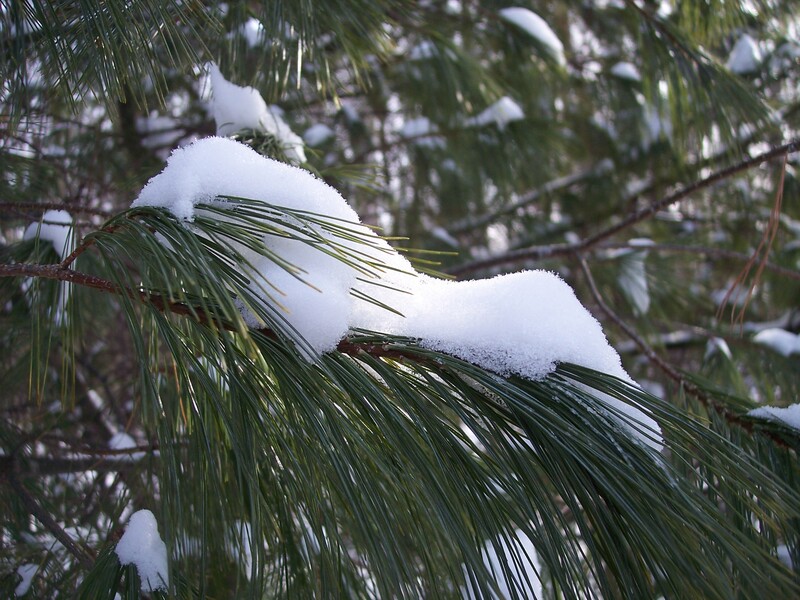 I passed some white pine trees where small clumps of snow were still clinging to the needles. 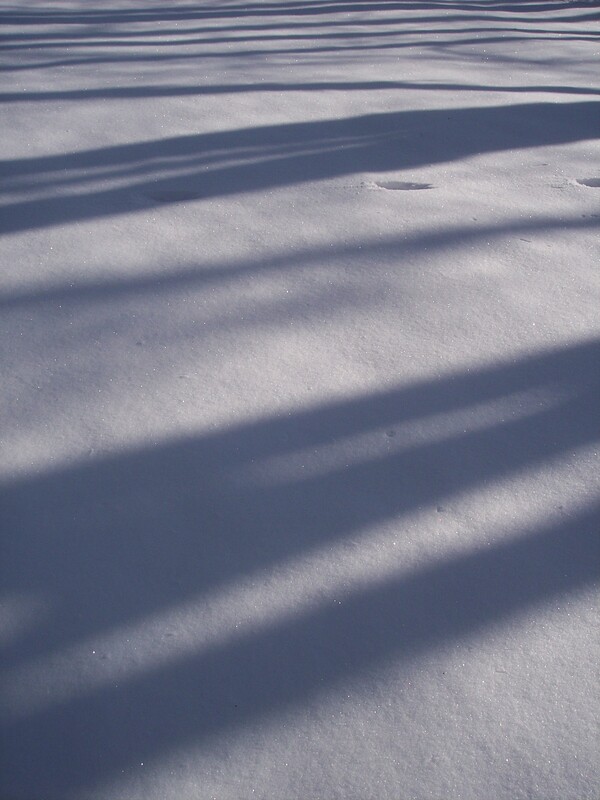 I continued on the trail as the shadows of the barren trees stretched across the snow. There is life under, and on top, of the snow. Tracks led from tree to tree, from log to rock. 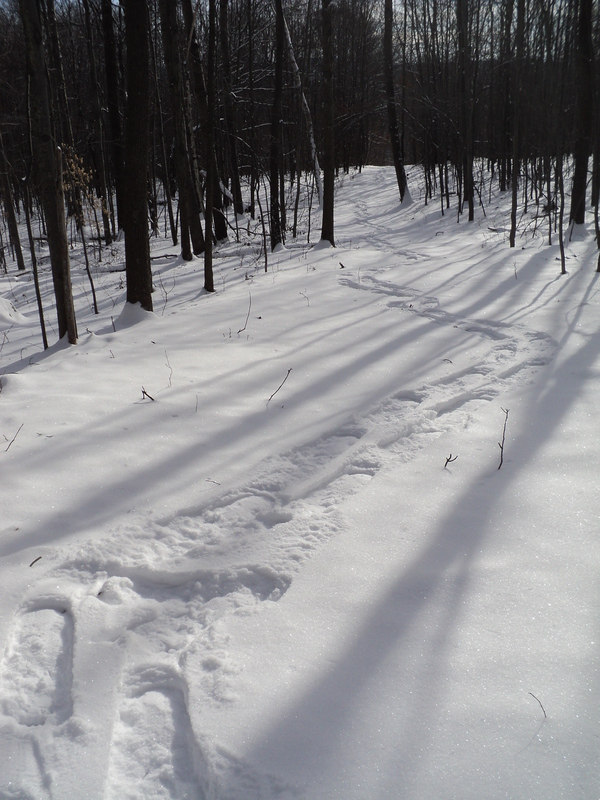 I saw deer, rabbit, squirrel, and fox tracks; even the delicate imprints of mice. They criss-crossed and sometimes funneled into one direction, or meandered without purpose across the carpet of white. And on top of the snow was the occasional insect that became confused about which season it was. 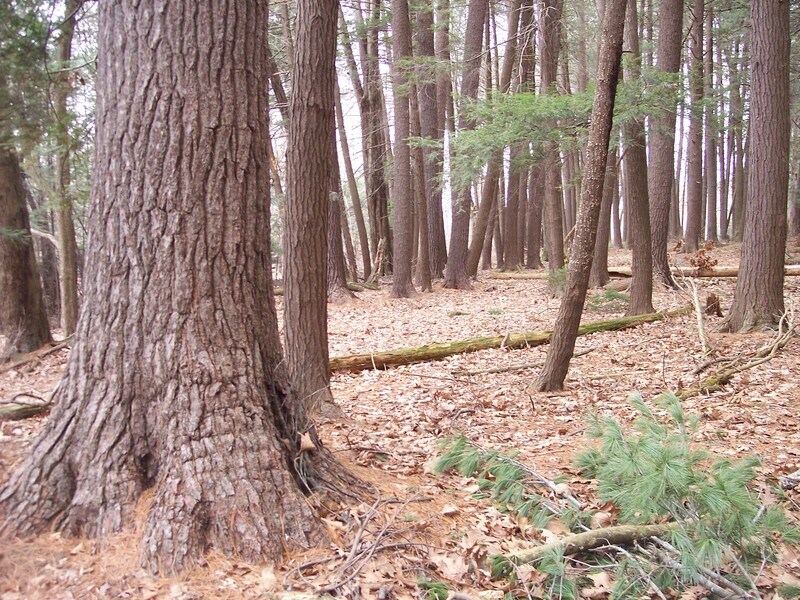 I then came upon a hemlock tree, and under it were five depressions where deer bedded down for the night. 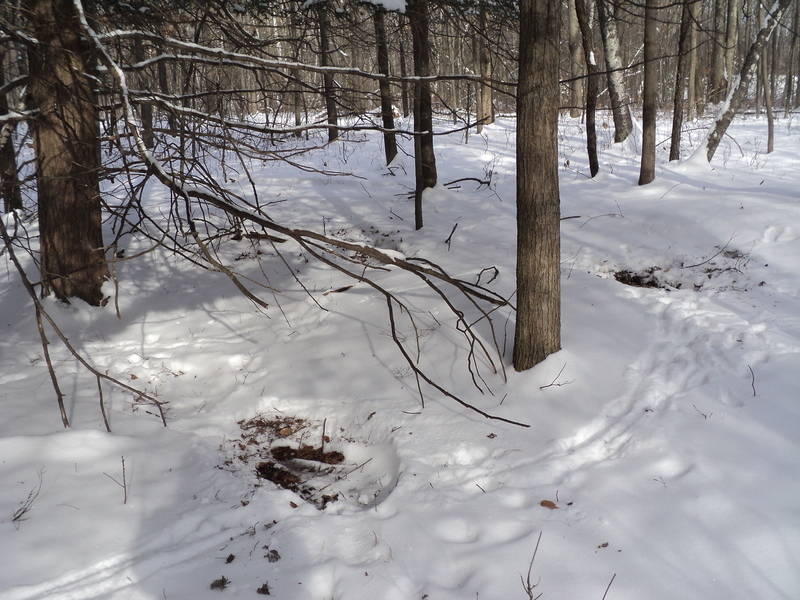 Three more deer bedded down under another hemlock not too far away. 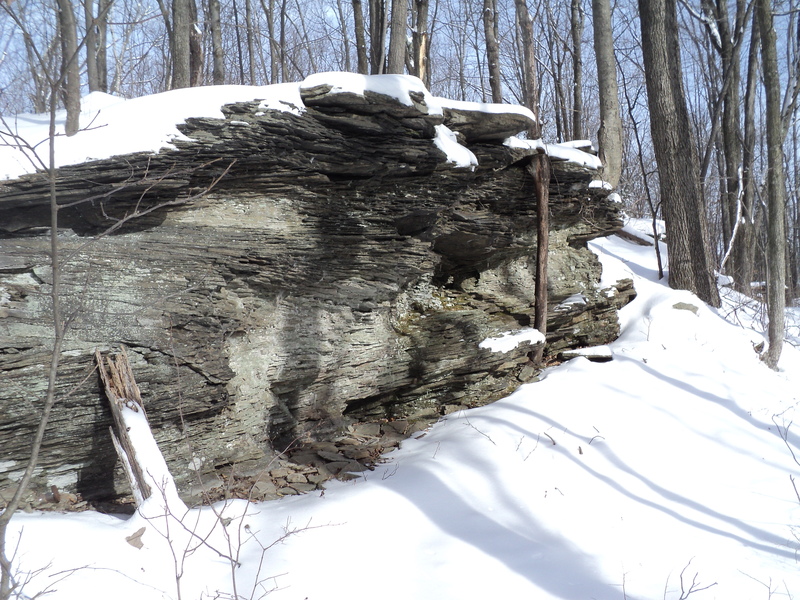 I then snowshoed the trail to a small flaking ledge with many small caves and holes. I hoped to find some more animal tracks around these ledges, but there weren’t any. 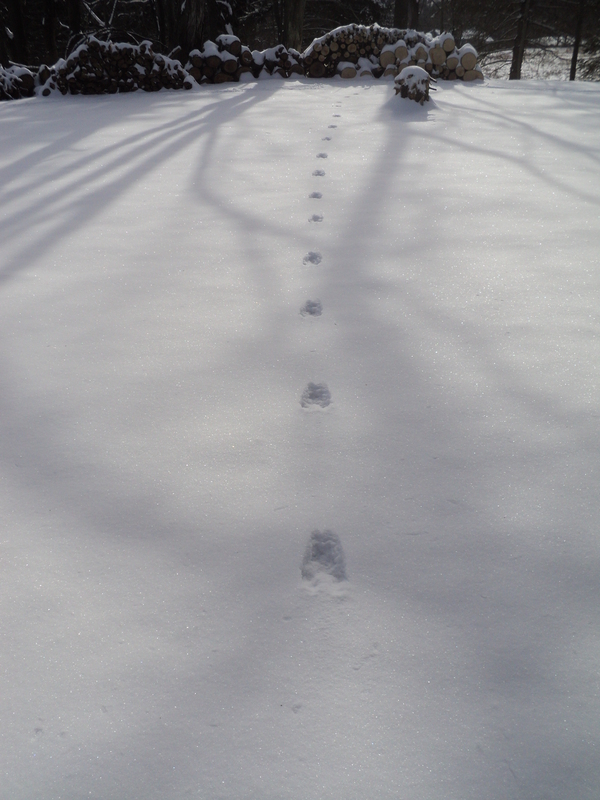 I finally made it back to my yard to see the tracks of animals heading in every direction, and then they would disappear before reaching a tree- the work of ghostly squirrels. I’m glad I was able to enjoy the snow, for only a few days later it was all gone. 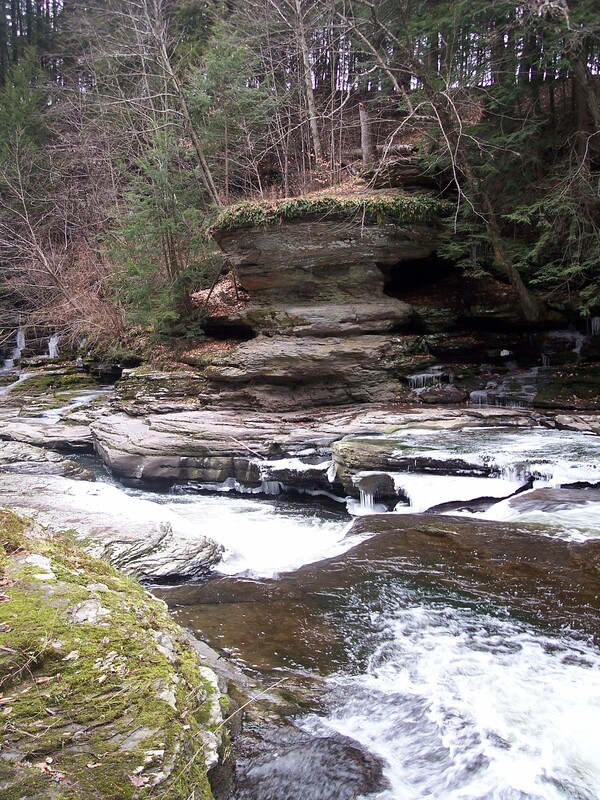 Although small in size, Little Rocky Glen is big on beauty. 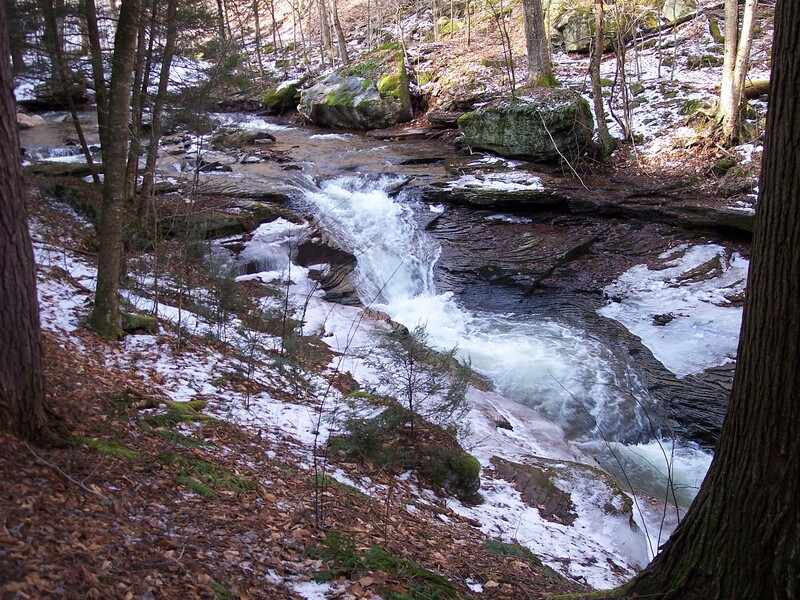 This small preserve is owned and protected by the Countryside Conservancy and it encompasses a shale and sandstone gorge, about one hundred feet deep, carved by the South Branch Tunkhannock Creek. 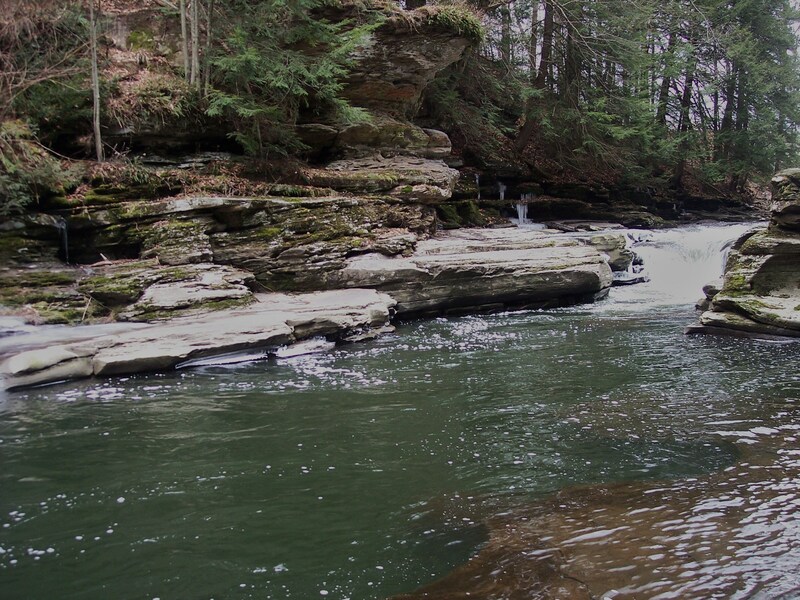 The creek features cascades and rapids, with deep pools and potholes carved into the bedrock. Cliffs and ledges rise above the creek, often draped by ferns and hemlocks. 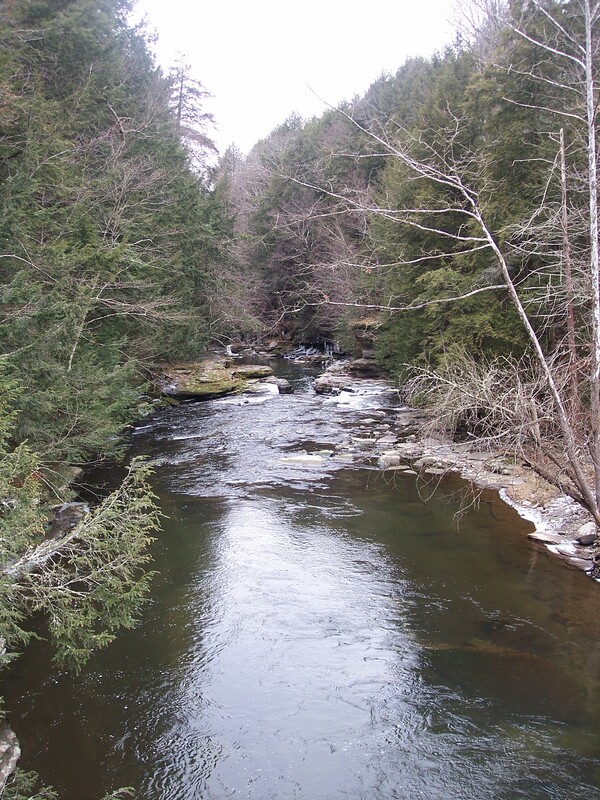 The preserve is located between Tunkhannock and Factoryville, just off of US 6, along Lithia Valley Road. There is a new gravel parking lot on the right, if driving from US 6, before the new concrete bridge. 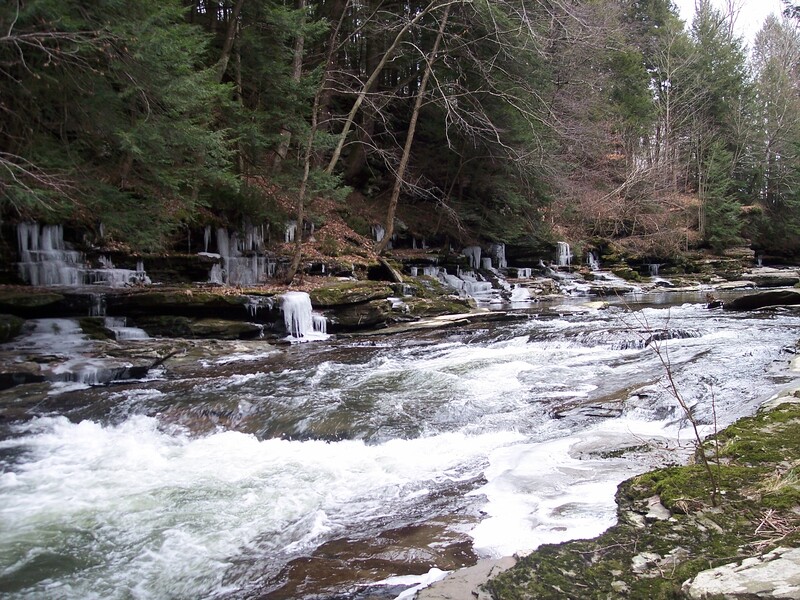 To be close to the creek, hike along the south side of it, where shelves of ledges rise above the water. Although it is not hard, watch for slick spots. You can hike to the big ledge at the falls and look at the potholes. Continue down into the glen to see the rapids, boulders, and cliffs carpeted with moss. Avoid this section of the glen in high water because there are very powerful rapids. Kayakers enjoy running the glen when the water is high. I’ve paddled the glen many times, with mixed results. I’ve flipped, swam, and even lost my boat once. My friends found it about a half-mile downstream, perched on a rock as if it belonged there. Trails also lead from the parking lot to cliffs overlooking the glen; they lead down to a field and the bottom pool where there is a picnic pavillion. It is a beautiful place to relax and enjoy the scenery. The pavillion is made of wood and blends into the setting perfectly. I enjoy visiting glen when I want a quick, convenient place to get outside. The trails are not marked or blazed, but they are generally easy to follow. 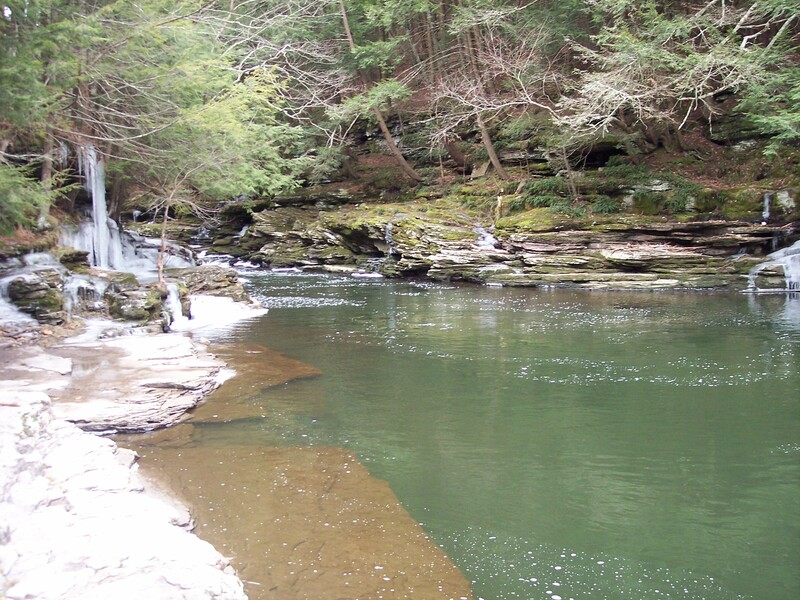 Kids love the glen, and it is a great place to take them in low water; they will be enthralled by the water, pools, rocks, and wildlife. 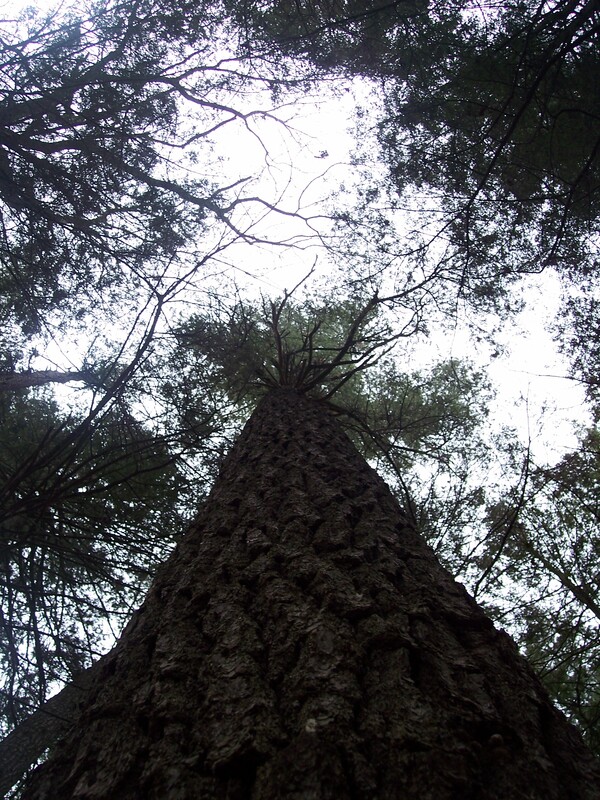 At the outlet of Lake Winola is a hidden gem- a forest of white pine that is possibly old-growth; you will also find hemlocks and some huge oak trees. Park at the boat launch and cross the road to a concrete slab that was once a merry-go-round. There is an obvious, but unmarked, trail that enters the forest. The forest is quite beautiful, with may trees easily towering over 100 feet. The forest floor is open, with only a few saplings and ferns; off to the right is a small creek. The pine forest ends at another small creek, which the trail crosses and leads to the ballfields. Here there are a few monstrous oak trees. You can retrace your steps, or make a loop through the forest by climbing a gradual ascent, although the path is not as obvious. 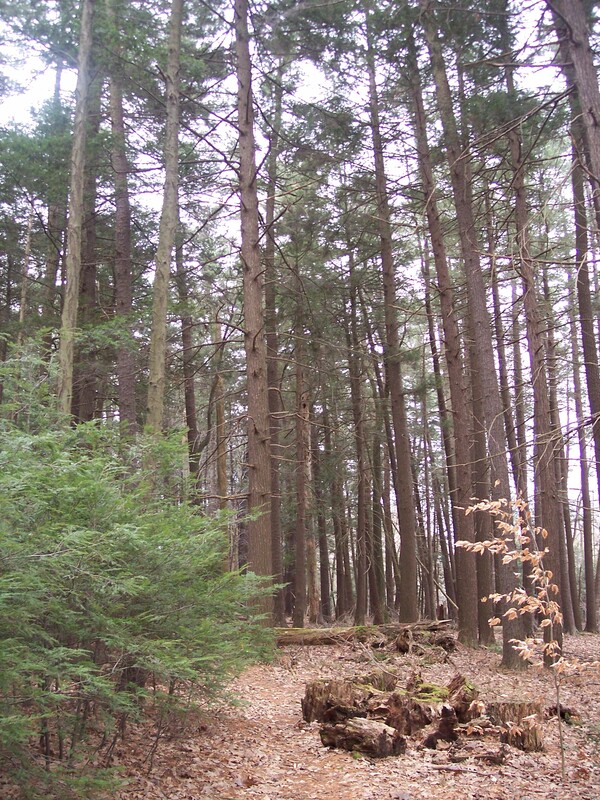 The pine forest is not large, maybe 20 acres or so and it is owned by the Pennsylvania Fish and Boat Commission. 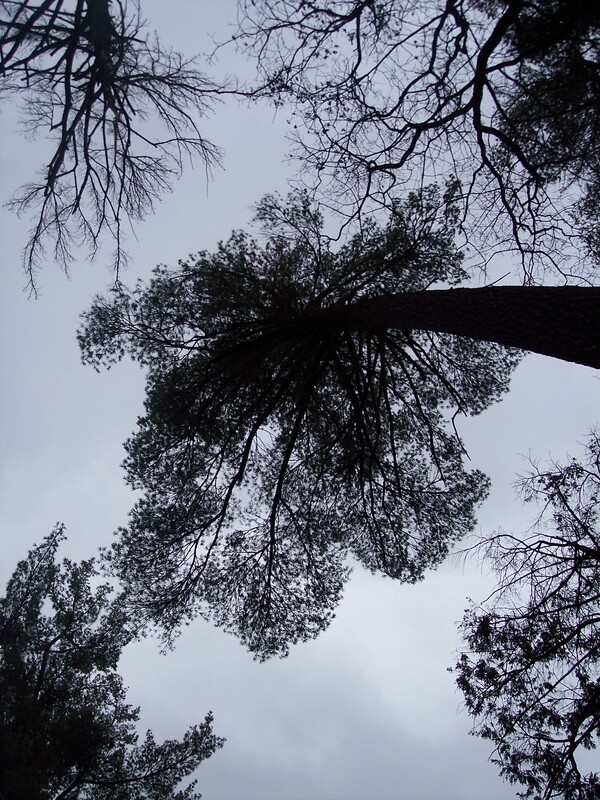 The terrain is easy and ideal for children; the forest floor is often carpeted with pine needles. As you walk, you may hear the rapid-fire of a woodpecker. As you come back to where you started, you may see another trail heading uphill. This leads to the old trolley railroad grade across the road that ended at Lake Winola and once went to Clarks Summit. The Countryside Conservancy is presently working on the Trolley Trail from Clarks Summit to Factoryville; someday it may extend to Lake Winola. This forest is a gem hidden in plain sight. The next time you are at the Lake Winola boat launch, just cross the road to see the beauty of this forest.